Atop the hill behind the Portage Lake Camp, Sunny Lake is another little known, seldom fished bass factory. Loaded with largemouths, this rocky lake has all kinds of shoreline cover and weedgrowth. Even fishing slowly, Sunny Lake presents only about half a day’s bassin’. But, oh, what a half day ! The path up to Sunny Lake is seldom used and a bit obscured at times. One route runs up the hill from the large back bay just down from the camp. A clear lake, Sunny Lake bass are a bit spooky, but respond hungrily when a quiet, subtle approach is used. 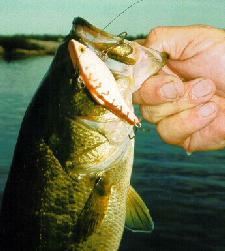 Try small topwater plugs, crawfish crankbaits, small rattlebaits, in-line spinners or small plastic worms or lizards. Use light line and spinning tackle to maximize the thrill of catching one feisty bass after another. Before going up to Sunny Lake, check with the Tornado’s staff to determine if an outboard motor is available there. If not, you probably won’t want to carry one up !